Low Profile BAGZ™ have been designed with a sleek low-profile design. Utilizing super bright red LEDs behind a red or smoked lens to provide contrasting red running light with full intensity turn signal or brake/turn light to the OEM Harley-Davidson® hard saddlebags. Low Profile BAGZ™ come pre-taped and include a plug and play wiring adapter for an effortless install. Lifetime LED warranty. 2014-2019 Harley-Davidson® Street Glide (FLHX), Street Glide Special (FLHXS), Street Glide CVO (FLHXSE) Road Glide (FLTRX) Road Glide CVO (FLTRXSE) , Road Glide Special (FLTRXS), Road Glide Ultra (FLTRU) Road Glide Ultra CVO (FLTRUSE), Ultra Classic (FLHTCU), Ultra Classic Low (FLHTCUL), Ultra Limited (FLHTK), Ultra Limited Low (FLHTKL), Ultra Limited CVO (FLHTKSE) Road King (FLHR), Road King CVO (FLTRXSE) and Road King Special (FLHRS).. Available in plug & play configuration for Run/Turn or Run/Brake/Turn function depending on model. Reference Fitment Below. 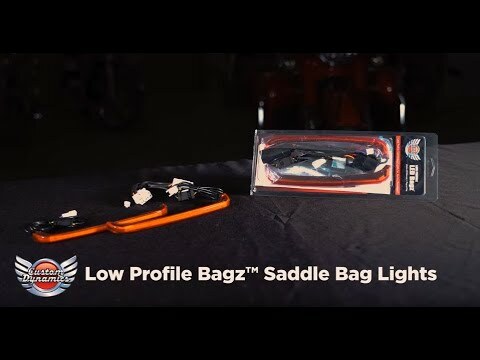 Additional Low Profile BAGZ™ Fitments also available for 1997-2013 Harley-Davidson® Touring Models, 2010-2013 Street Glide and Road Glide Custom, and 2009-2013 CVO™ Street Glide, Road Glide, and Road King models. Functions as Run/Brake/Turn on 2014-2019 Street Glide, Street Glide Special, Electra Glide Ultra Classic, Ultra Limited, Ultra Limited Low, Ultra Classic Low, Road Glide, Road Glide Special, Road Glide® Ultra, Road King Special, 2016-2019 CVO™ Road Glide Ultra and CVO™ Limited. Use in conjunction with our Magic Strobes Brake Light Flasher for additional brake visibility. The BCM can be serviced by a Harley Davidson™ Technician to have Run/Brake/Turn function. Custom Dynamics® SMART Triple Play® is a simple plug and play alternative option for Run/Brake/Turn function.